Exploding debt may potentially lead to an economic crisis and reward an allocation to gold. Paradigm Capital reports that the number of Google searches to buy gold has dropped to the lowest since July 2007, just before the global financial crisis. Meanwhile, according to The Wall Street Journal, Dealogic reports that newly listed tech stocks are up roughly 52% on average from their IPO price in 2018. The divergence between safe haven1 and speculative investments seems to be reaching extremes. The lack of interest in gold is reflected in the July price decline of $29.08 (2.3%) to $1,224.09 per ounce, a 12-month low. Similar to June, U.S. dollar strength and weak metals prices weighed on gold last month. The dollar held on to its June gains and the U.S. Dollar Index (DXY)2 established a fresh 12-month high following the July 17 Congressional testimony by Federal Reserve Chairman Jerome Powell, who delivered an upbeat assessment of the economy. Second quarter GDP growth hit 4.1%, but we question its sustainability. Declining trends in housing starts and sales suggest the Trump tax stimulus has run its course, while tariffs may eventually hamper growth. Also, 4.1% growth is relatively weak according to Gluskin Sheff3 who found that real growth averaged 5.5% in the quarter following the four tax cuts of similar magnitude since 1960. Gold stock performance was mixed. The MVIS Global Junior Gold Miners Index (MVGDXJTR)4 fell 2.8%, nearly matching gold’s performance. However, the NYSE Arca Gold Miners Index (GDMNTR)5 fell 4.4%, which reflects the disappointing second quarter results of several of the large gold companies. Barrick Gold (0.0% of net assets*), Agnico Eagle (4.5% of net assets*), and Goldcorp (2.9% of net assets*), reported earnings below market expectations. Reasons included higher taxes, timing of sales, and realized prices. Operating and cost results were as expected, and all maintained their 2018 guidance. The lone exception was Agnico, which raised its production guidance by 50,000 ounces (3%). It seems these companies were unduly punished in a thin summer market, and we expect the stocks to recover in the second half of the year. Apart from these three companies, second quarter results have been positive for other majors and mid-tiers that have reported so far. There has been a striking divergence in flows of gold bullion and gold equity exchange traded funds (ETFs). Over the last two months, gold bullion ETFs have seen steady outflows with bullion holdings falling 3.2%. Over the same period, the gold equity ETFs, VanEck Vectors Gold Miners ETF (GDX) and VanEck Vectors Junior Gold Miners ETF (GDXJ), have seen their share counts increase steadily by 19.8% and 10.2%, respectively. We do not know what is causing the divergence, but suspect it might be positioning by investors aware of the valuation discount in gold miners. RBC Capital Markets calculates average price/cash flow for mid-tiers and majors of roughly 7x, compared to a long-term average of 11x. We thought the gold market would rally following the June Fed rate increase, as it has for each rate increase over the last two years. However, the fall in the gold price to its yearly lows has caused us to adjust our outlook. The rising trend of higher lows discussed in our May update has failed, and gold seems to be establishing a new pattern with a base around the $1,200 per ounce level. Net speculative futures positioning is approaching levels last seen at the bottom of the bear market in December 2015. This, along with recent redemptions in the bullion ETFs, suggest gold is oversold. In addition, the DXY appears to be topping out. We believe the gold market is poised for a rally in the second half. However, given current sentiment and price action, it is doubtful the metal can achieve new highs above the $1,365 “ceiling” discussed in our May update. The gold price continues to consolidate a solid base, but it looks like a catalyst that moves it to a higher range may not appear until later in 2019. The following chart from the Congressional Budget Office (CBO) should scare the daylights out of every citizen in the U.S. In fact, every citizen of China should be equally alarmed as their government is the largest holder of U.S. Treasuries. Source: Congressional Budgetary Office. The Long-Term Budget Outlook, June 2018. For illustrative purposes only. Federally guaranteed student debt is nearly $1.4 trillion. An Education Department report last November forecasted a $36 billion shortfall in government student loan programs. A year earlier it forecasted an $8.4 billion shortfall. Prior to that it forecasted billions in surpluses. This is a disturbing trend for taxpayers. Social Security costs will exceed its income this year, three years sooner than expected a year ago. The trust fund will be depleted in 2034, a year sooner than expected in last year’s report. Medicare and Medicaid face a similar deterioration in their trust funds. Corporate debt amounts to 45% of GDP, a level last seen in the financial crisis of 2008 and, before that, around the tech bust in 2001. The Wall Street Journal finds that in 2017 leveraged lending reached a new high of $1.6 trillion globally and new issues surpassed the previous record in 2007. Most leveraged loans are “covenant-lite”, with fewer restrictions on collateral, payment terms and level of income. Grant’s Interest Rate Observer in its March 23 edition cites Bianco Research, which finds 14.6% of S&P 1500 companies are zombies, meaning their earnings before interest and taxes fail to cover their interest expense. That’s up from 5.7% in the fourth quarter of 2007, just before the Great Recession. According to Gluskin Sheff, at the peak of the last credit bubble, the amount of U.S. debt across household, business, and government totaled $27 trillion, or 225% of GDP. A decade later it is now nearly $50 trillion, or 250% of GDP. Meanwhile, the global economy has added $25 trillion of debt in just the past year to reach 318% of global GDP. Both U.S. political parties have made it clear through their actions that they are not interested in reducing, or even stabilizing, the growth in debt. Likewise, voters are not willing to hold their leaders fiscally accountable. Without any adults in the room, we believe debt will continue to grow until it brings a crisis, just as sub-prime mortgages grew until 2008 when a crisis forced lenders and borrowers to stop. 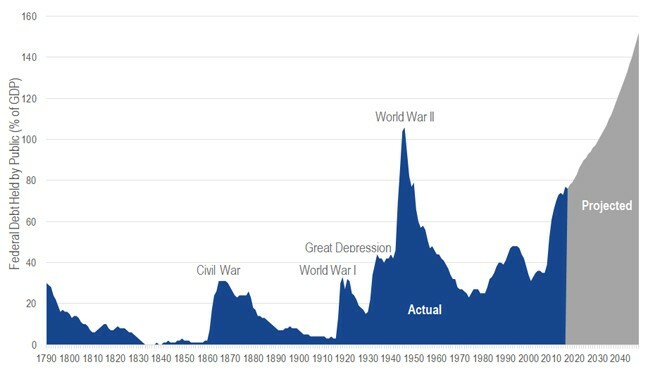 The difference now is that government debt is at the center of the current credit bubble. Politicians have not been willing to raise taxes or cut spending. Some call for higher taxes on the wealthy, but we believe such taxes have limitations and would not make a significant difference. High earners in states such as New York and California already have marginal rates for combined federal, state, and local taxes of around 50%. A model for proper fiscal and monetary behavior can be found down under. Australia is enjoying an amazing 27-year expansion. According to The Wall Street Journal, prior to the financial crisis, they reduced government debt from 32% of GDP in 1994 to just 10% in 2007. The Reserve Bank of Australia (RBA) did not make the mistake of leaving rates too low for too long. When the crisis came, the benchmark rate was 7.25%, leaving them plenty of room to stimulate growth without manipulating negative rates. Unfortunately, we know of no other developed nation that can claim such diligence. We believe the full weight of the global debt load will be felt in the next economic downturn. With Fed tightening currently underway, we believe that the 4.1% second quarter GDP growth is an aberration and the downturn might come sooner than most people think. The next debt crisis might bring money printing, monetization of debt, and other policies that are even more radical than those following the last crisis. While the prices of gold and gold shares have been in a soft spot for longer than we anticipated, we feel the potential financial risks on the horizon suggest that patience will ultimately pay off. *All company weightings, if mentioned, are as of July 31, 2018, unless otherwise noted. Nothing in this content should be considered a solicitation to buy or an offer to sell shares of any investment in any jurisdiction where the offer or solicitation would be unlawful under the securities laws of such jurisdiction, nor is it intended as investment, tax, financial, or legal advice. Investors should seek such professional advice for their particular situation and jurisdiction. 1Safe haven is an investment that is expected to retain its value or even increase its value in times of market turbulence. 2U.S. Dollar Index (DXY) indicates the general international value of the U.S. dollar. The DXY does this by averaging the exchange rates between the U.S. dollar and six major world currencies: Euro, Japanese yen, Pound sterling, Canadian dollar, Swedish kroner, and Swiss franc. 3Gluskin Sheff + Associates Inc., a Canadian independent wealth management firm, manages investment portfolios for high net worth investors, including entrepreneurs, professionals, family trusts, private charitable foundations, and estates. 4MVIS® Global Junior Gold Miners Index (MVGDXJTR) is a rules-based, modified market capitalization-weighted, float-adjusted index comprised of a global universe of publicly traded small- and medium-capitalization companies that generate at least 50% of their revenues from gold and/or silver mining, hold real property that has the potential to produce at least 50% of the company’s revenue from gold or silver mining when developed, or primarily invest in gold or silver. 5NYSE Arca Gold Miners Index (GDMNTR) is a modified market capitalization-weighted index comprised of publicly traded companies involved primarily in the mining for gold. Any indices listed are unmanaged indices and include the reinvestment of all dividends, but do not reflect the payment of transaction costs, advisory fees or expenses that are associated with an investment in a Fund. Certain indices may take into account withholding taxes. An index’s performance is not illustrative of a Fund’s performance. Indices are not securities in which investments can be made. Fund shares are not individually redeemable and will be issued and redeemed at their net asset value (NAV) only through certain authorized broker-dealers in large, specified blocks of shares called "creation units" and otherwise can be bought and sold only through exchange trading. Shares may trade at a premium or discount to their NAV in the secondary market. You will incur brokerage expenses when trading Fund shares in the secondary market. Past performance is no guarantee of future results. Please call 800.826.2333 or visit vaneck.com for performance information current to the most recent month end and for a free prospectus and summary prospectus. An investor should consider the Fund's investment objective, risks, charges and expenses carefully before investing. The prospectus and summary prospectus contain this as well as other information. Please read them carefully before investing.